Known as the Working Class Airsoft company for its dedication to providing affordable AEGs that work well, Echo1USA strives to provide customers with an uncompromising quality of products and customer service. As avid airsoft players, those who work at this company understand the needs of the sport and its devotees and the frustration players have with inferior products. Echo 1 is committed to delivering the finest and most affordable airsoft guns and accessories on the market today. That is the foundation of this outfit's continued success. 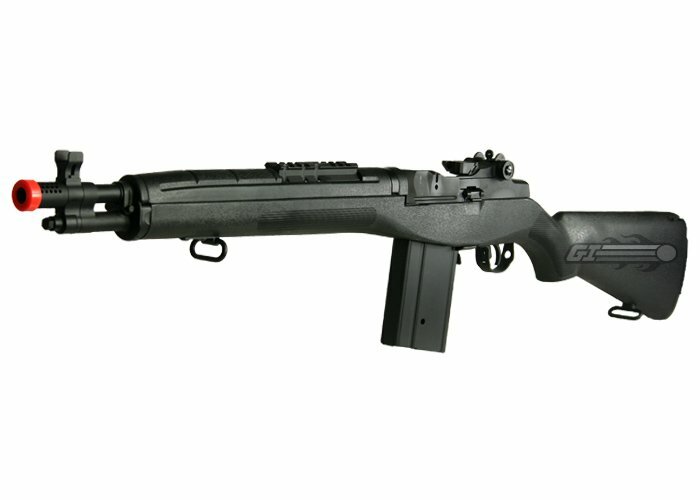 The Echo1 M14 SOCOM from Airsoft GI is the clone you've been waiting for. It has it all: looks, performance, reliability and compatibility. The look and feel of the Echo 1 is solid. 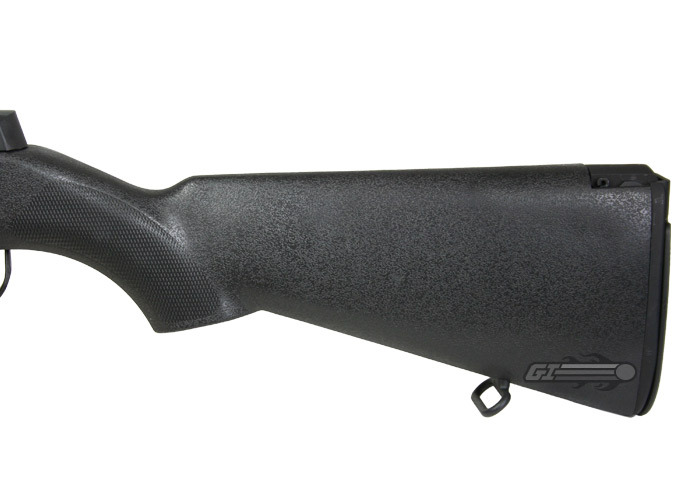 Weighing approximately 7 1/2 pounds, this gun has just the right amount of heft and will feel right in your hands. It looks and feels much like the Tokyo Marui and G&G M14. The internals have been completely re-engineered and cleaned up, making it totally compatible with aftermarket upgrade and replacement parts, like Systema and Prometheus. That means you can rig this gun to suit your style and the types of environments you play in. This gun shoots very accurately even at long ranges, allowing you to easily pick off unsuspecting victims who underestimate you and your gun. The UTG and AGM M14 don't even come close to the ECHO 1 in the way off engineering, performance and compatibility with parts. The Echo 1 is equipped with standard SOCOM 16 characteristics, like the shortened barrel with compensator, and top rail on the heat shield for accessories like optics. The stock is large enough to house a large 8.4V battery, so you can play all day without stopping to recharge. The Echo 1 is without a doubt the BEST airsoft SOCOM 16 on the market for your money. first time and 4 hours subsequent times. Make sure to check the battery every hour to insure it is not too hot. This product is covered under warranty, click HERE to read warranty information. First off, I have always loved the m14 style of rifles, and the echo 1 SOCOM 16 is great!!!!! this was the first rifle I bought and i have loved it since I opened the box. To me the weight of the rifle is perfect. I have no problems with running with it in a CQB scenarios, field play or even being DMR. To me the only real con about this gun would be the battery compartment, but other than that i would tell people to buy this gun in a heartbeat. I have never had a problem with the gears or motor, the accuracy on it is amazing. So what are you waiting for go get this gun!!!!!!! This gun is an excellent buy. it seems that it is basically a cyma cmo.32. i say this because after removing the front and rear sight, they both say cm.32. this might just be parts on the echo 1 but i couldn't help but see that. this gun kinda dissapointed me in the performance department. the gun shoots 380 right out of the box which honestly makes me wonder why they would give a dmr a lower fps than some guns with shorter barrels. this doesnt matter too much because the long barrel allows it to reach targets at much further ranges. i have also tested this gun with an 11.1v lipo battery and the rof performance is very respectable. the aesthetics are very nice and all the metal parts are very high quality. the charging handle is probably the funnest part on this gun. it gives a very satisfying clack when racked. overall very satisfying gun and a definite good buy for the price. 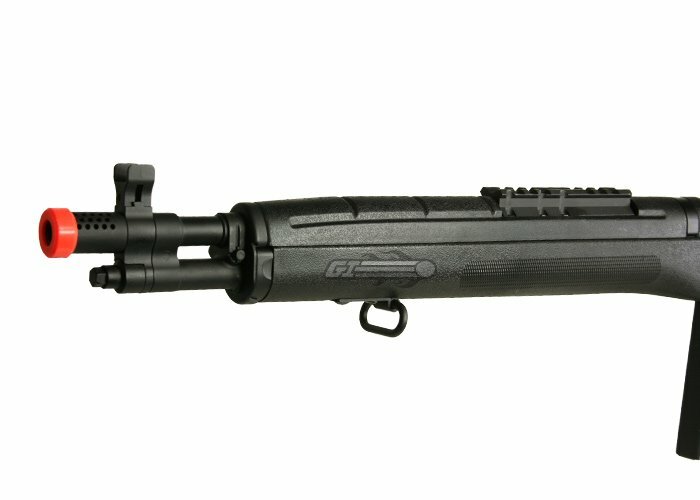 The Echo 1 M14 SOCOM is a shorter version of the typical M14, and this makes it a short DMR. This weapon is slightly on the heavier side, weighing in at around 7.5 pounds without a battery, mag, or optic, so about 10 pounds after the gun is locked and loaded. After 2-3 games, your shoulders will definitely grow sore from it's weight. The Echo 1 M14 also lacks a lot of needed rail space, but I find that just a simple red dot works well. However, despite being a heavy weapon, this rifle performs like a charm. I've hit targets beyond 200+ feet, and this weapon feeds well with the provided Hi-Cap mag. That, paired with the fact that this rifle has a comfortable grip, and feels strong in your hand, contributes to a good feeling rifle. I recommend using .28g BB's, as I have found that this weight of BB provides the best accuracy, with the longest range. I give this weapon a 4 star rating, because of the lack of rail space, and this M14's weight (which can even be considered a plus, depending on how you look at it). The Echo 1 M14 Is an excellent beginner's/intermediate weapon if you are looking to fulfill a DMR type role for your team. Echo 1 continues to sell affordable, well performing weaponry, and I will continue to buy from them. *Shoots very accurately at 380~390 FPS. *The range on this rifle reaches out and grabs the unsuspecting personnel. *Good metal Hi-Cap included magazine. *1996 SOCOM feel to the weapon. *Not a lot of rail space. *Polymer body, could be a con or a pro depending on personal preference. Is the whole gun made of polymer or metal? It's 7.5 pounds so that's heavy polymer if it is polymer. 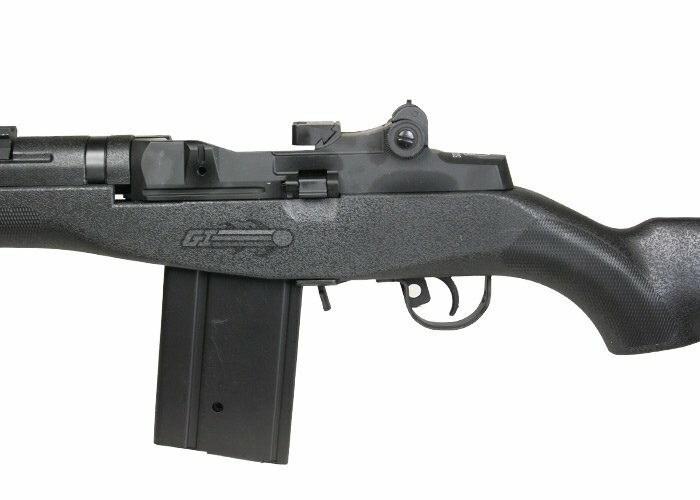 Do you guys have any full vests or chest rigs I can get for M14 mags or do I just have to make one? And is the whole gun metal,or polymer? That's unfortunate, the miracle barrel seems like a great upgrade, what are some other barrel upgrade options I can look into? Will a "Miracle Barrel" be too long for this shortened barrel? Will this barrel: The Magic Box Miracle TOT Inner Barrel for M14 (500mm) be too long for this shortened barrel? Is there any type of bipod, ex. universal bipod that can be used on this gun? M14 style bipods will work. The stock is plastic, and should use a small type battery. Are their and sort of threads underneath the flash hider? There are no threads underneath the SOC16 flash hider.